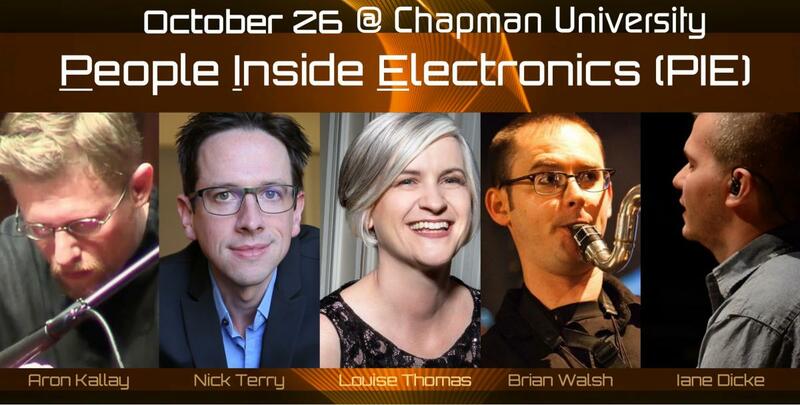 Chapman University’s New Horizons Concert Series presents People Inside Electronics (PIE), a contemporary ensemble that has been presenting cutting-edge performances in Southern California for nearly a decade. PIE is at the forefront of L.A.’s burgeoning new music scene with repertoire ranging from augmented instruments to human-computer improvisation and lifelike sound sculpture rainforests to collaborations with the best and most respected performers on the West Coast. This performance features Ian Dicke’s Cowboy Rounds – a song cycle for piano/vocalist and live electronic processing that explores folk traditions in the digital age, and stunning music for piano, percussion, and clarinet by Amanda Feery, Kyong Mee Choi, and Alexandra Gardner, among others. Performers include GRAMMY®-winning percussionist Nick Terry, GRAMMY-nominated pianist Aron Kallay, and Louise Thomas (Chapman faculty members), and multifaceted clarinetist Brian Walsh. Cowboy Rounds is a song cycle for piano/vocalist and live electronic processing. This work “remixes” pre-existing source material culled from the John and Ruby Lomax 1939 Southern States Recording Trip, an ethnographic field collection hosted online by the Library of Congress. Cowboy Rounds reexamines oral tradition and ownership through the lens of today’s internet-driven free culture movement. The folk recordings within the Lomax archive do not represent a final, unchangeable document, but rather a snapshot of each song, unique to its time, place, and performer. The lack of copyright in these field recordings invites current and future generations of musicians to continue developing the songs, either through digital manipulation of the recorded material itself or reconstructing elements of the recording through live performance. In that sense, Cowboy Rounds is a work deliberately caught between the ideological constructs of permanence and ephemera while building an intersection between new technologies and old traditions.